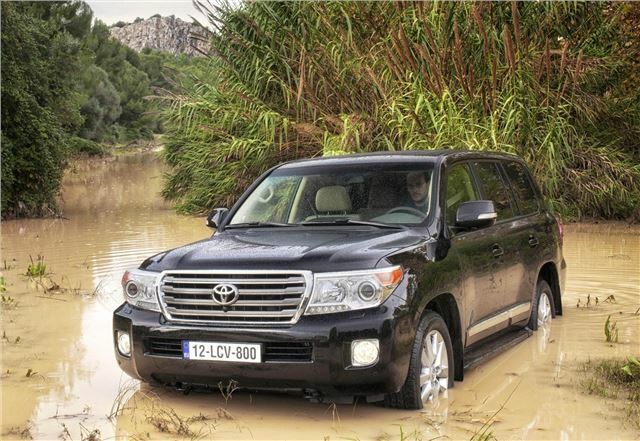 Toyota’s flagship Land Cruiser 4x4 has been given an overhaul for 2012, with an improved V8 engine, reworked styling and more technology. It goes in sale in the UK in March, and prices will be revealed nearer the time. Externally, the Land Cruiser has been given a restyled bumper, new headlamps with LED running lights, a new grille, new LED rear light clusters and new design 20 inch alloy wheels. Internally the changes include a lighter colour scheme, a new centre console and improved material quality. The leather seats are can be heated or cooled, and active headrests reduce whiplash in an accident. Toyota’s Touch Pro infotainment system is present, offering DAB radio, internet connectivity, Bluetooth, DVD player, rear-view camera and Google maps based sat nav. In order to improve the Land Cruiser's off-road capability there is a host of technology, including external cameras, creep control, tyre angle display, and turn assist to improve the turning circle. The 4.5-litre V8 engine has been overhauled, making it Euro V compliant. Changes include the addition of a diesel particulate filter and a new injection system. Peak power is 286bhp, but more important in a 4x4 is the torque figure, which is 650Nm from 1600-2800rpm. Final UK specifications and prices will be announced nearer to the new Land Cruiser being launched in March.